Terriers were unlucky not to take all three points at Hall Lane on Tuesday night (August 7). Joint managers Keith Brown and David Leightley made four changes from the team that lost at Chester le Street on Saturday. David Stewart replaced the injured Callum Dobson in goal while new signing John Sherlock, Paul Wardle and Darren Riddell came in for Chris Locke, Stephen Young and Ronnie Jones. Terriers started brightly with Sherlock at the heart of the action. After three minutes, he fired over the bar while, on six minutes, his shot from a Chris Glass header back into the penalty was blocked, with Terriers unable to force home the rebound. Then after nine minutes, Sherlock took the ball past three defenders before shooting straight at the keeper from the edge of the area. After 20 minutes, the home team had the first meaningful shot on target when Joe Bates shot from 20 yards struck the top of the crossbar. Sherlock then again shot straight at the keeper from 30 yards after 31 minutes before having a header cleared off he line after 32 minutes. Terriers' final chance of the half came after 36 minutes when Wardle was played in by Sherlock but his shot was well saved by the home keeper. The second saw an early Chris Glass shot after 46 minutes easily collected by the keeper, before Sherlock had two chances in a minute well saved. After 56 minutes, a flyer from 25 yards was tipped over the bar by the keeper. Sherlock then beat three men in the penalty area only for his shot to be pushed against the post by the home keeper. Terriers had time for more chances. After 75 minutes, a crossfield ball from Ward was met at the back post by Young, who chipped the keeper only to see his shot narrowly wide of the back post, while a mazy run by Steve Gibson two minutes later enabled him to send Glass away down the right. The cross from Glass bobbled in front of Young who was unable to get his shot in. It was a very workmanlike performance from Terriers with an outstanding debut from Sherlock. Terriers were unlucky not to take all three points from the game. Leightley said afterwards: “The only thing that isn’t positive tonight is the result." Next up for Terriers is the first home league game of the season against West Allotment Celtic at Dr Pit Park. 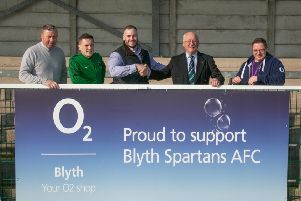 New signing from Blyth AFC, Cameron Fenton is expected to make his debut. Fenton is a striker who has previously played for Gateshead and Shildon.